August 6, 2009 – American Phytopathological Society Excellence in Industry Award presented to H. Charles Mellinger, Ph.D.
September 2008 – “Friends of IPM Implementation Award” presented to Madeline Mellinger and H. Charles Mellinger, Ph.D. by the Southern IPM Region at the Florida Fruit & Vegetable Association Annual Meeting. 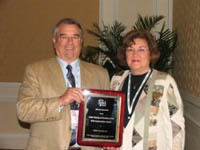 July 2008 – Florida Entomological Society Pioneer Lecture Honorees awarded to Madeline Mellinger and H. Charles Mellinger, Ph.D.
April 4, 2006 – National IPM (Integrated Pest Management) Achievement Award presented to Madeline Mellinger and H. Charles Mellinger, Ph.D. at the 5th National IPM Symposium. December 19, 2002 – EPA Awards Glades Crop Care, Inc. for Significant Progress in Reducing Pesticide Risk. 1997 – American Cyanamid Outstanding Consultant of the Year presented to H. Charles Mellinger, Ph.D.
1997 – Florida State Horticultural Society President’s Industry Award presented to H. Charles Mellinger, Ph.D.
1991 – USDA / APHIS Certificate of Appreciation awarded to H. Charles Mellinger, Ph.D.
1991 – NAICC Extraordinary Service Award presented to H. Charles Mellinger, Ph.D.